Washington sophomore Rayana Burns puts up a shot against Vinton County in a Division II District semifinal game Thursday, Feb. 22, 2018 at Southeastern High School. Pictured for Vinton County is freshman Morgan Bentley (21). Washington junior Kassidy Hines (5) takes a shot in near the basket in a Division II District semifinal against Vinton County Thursday, Feb. 22, 2018 at Southeastern High School. Pictured for Vinton County is freshman Morgan Bentley (21). 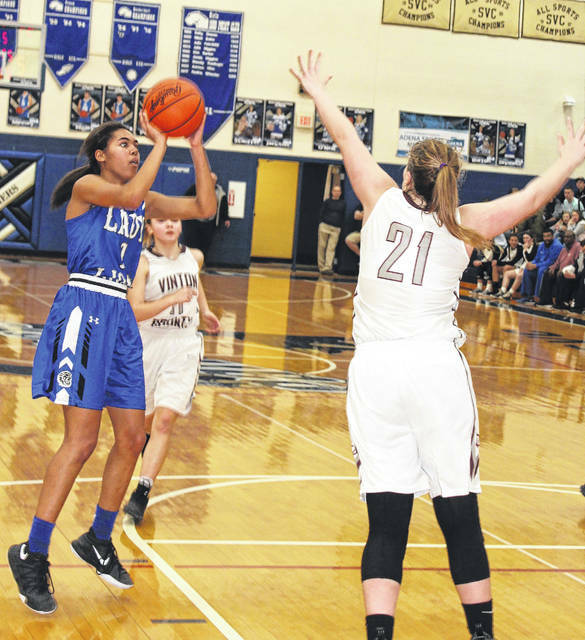 CHILLICOTHE — The Washington Lady Blue Lions parlayed a tremendous start into a District semifinal victory over the Vinton County Vikings in the Division II tournament at Southeastern High School Thursday night. The Lady Lions began with a 17-1 lead and went on to post a 69-53 victory. Washington will now play Thornville Sheridan for a District championship Wednesday, Feb. 28 at 7 p.m. back at Southeastern High School. Sheridan defeated Miami Trace Thursday, 42-29. Washington, now 22-3, had four players in double figures, led by sophomore Shawna Conger with 18 points. Junior Bre Taylor scored 14 points, sophomore Rayana Burns scored 12 and junior Hannah Haithcock had 10 points and 20 rebounds. 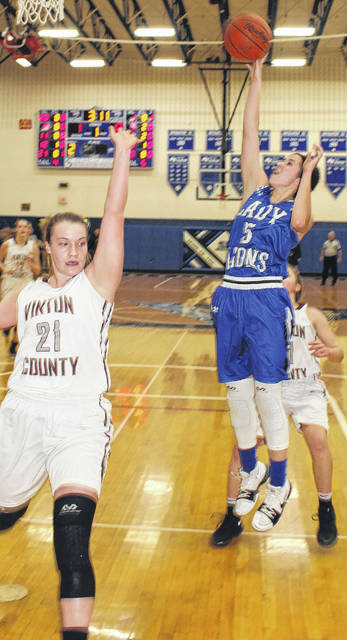 For Vinton County, senior Cassie Bentley and freshman Morgan Bentley each scored 19 points. Senior Erin Jones also reached double figures with 12 points. Vinton County finishes the 2017-18 season with a record of 21-2. With Washington leading, 15-1, there was an approximately 30-minute delay as a Vinton County player was injured and had to be taken to hospital by a local life squad unit. The Lady Lions led 19-6 at the end of the first quarter. Washington kept the offense humming in the second quarter, again scoring 19 points. This time, Vinton County had 11 points to put the score at 38-17 at the half. Vinton County got within 16 points of Washington in the third quarter. After three complete, Washington was in front, 54-33. Vinton County kept scrapping and kept battling and despite the ongoing deficit. Washington led by as many as 26 points in the fourth quarter, while Vinton County cut the margin to 15 points with 1:35 to play in the game. “I’m very proud of the girls,” Washington head coach Samantha Leach said. “It was a team effort, from start to finish. We talked about how we had to compete for 32 minutes tonight. We came out ready to go. We ran the floor very well; shared the ball well. “We just had so much production in transition tonight,” Leach said. “I thought we did extremely well with that. “We kept talking about having an attack mentality,” Leach said. “Both Bre (Taylor) and Shawna (Conger), girls that you think of as three-point shooters, did a very good job of attacking the rim and executing our game plan tonight. Tickets: Stop by the high school during regular school hours to purchase tickets for the Washington vs. Sheridan District championship game. Tickets are $6 each and the school gets to keep 25 percent of the proceeds of tickets it sells. WASHINGTON — Rayana Burns 5-2-12; Maddy Garrison 2-0-4; Bre Taylor 7-0-14; Kassidy Hines 2-0-4; Tabby Woods 0-1-1; Halli Wall 0 (2)-0-6; Shawna Conger 3 (2)-6-18; Maddy Jenkins 0-0-0; Hannah Haithcock 4-2-10. TOTALS — 23 (4)-11-69. Free throw shooting: 11 of 20 for 55 percent. Three-point field goals: Wall, 2; Conger, 2. Combined field goal shooting: 27 of 56 for 48 percent. Turnovers: 14. VINTON COUNTY — Darian Radabaugh 0-1-1; Emily Jones 0-0-0; Erin Jones 2 (2)-2-12; Abriana McManus 0-0-0; Josie Ousley 0-2-2; Cassie Bentley 6 (1)-4-19; Belle Lambert 0-0-0; Morgan Bentley 3 (3)-4-19; Rianna Fee 0-0-0; Lexi Erikson 0-0-0; Kendall Fee 0-0-0; Lydia Nichols 0-0-0. TOTALS — 11 (6)-13-53. Free throw shooting: 13 of 18 for Three-point field goals: M. Bentley, 3; Er. Jones, 2; C. Bentley. Combined field goal shooting: 17 of 50 for 34 percent. Turnovers: 14.